And, thank goodness for that! I love the wild flowers that bloom during the spring in south Texas. I smile every time I drive by a carpet of bluebonnets or Indian paintbrush or pink mallow. Sometime last fall, I discovered that I really liked some of the student repertoire I was teaching. So I decided to learn it and showcase “my” discoveries by videotaping some informal performances of it and including some brief pedagogical narration about the compositions. These videos also give me a chance to feature my beautiful studio and German Steinway concert grand located in Bulverde, Texas. The first two pieces I recorded are from Accent on Classical, a compilation of early to mid-intermediate works by William Gillock. To me, the two most charming pieces from this collection are “Homage to Chopin” and “Capriccietto”. The “Homage to Chopin” has a whimsical quality that encourages the student to explore and develop tempo rubato. This piece is also a wonderful vehicle for the young student to develop an una corda pedal technique, beyond just pushing the left pedal down for measures at a time. In “Capriccietto”, Gillock writes what I would describe as intermittent pedaling which does require some foot dexterity to avoid dirty pedaling. There is also an eight-measure passage where the student can make a crescendo and an accelerando–I have yet to meet a kid who doesn’t like to play loud and fast! I remember when I was growing up, William Gillock’s music was all the rage amongst private piano teachers. As I got older and started to develop my own musical taste, I remember thinking that Gillock’s music was somewhat juvenile and why would I want to teach it, let alone play it???? My, how things have changed. I hope you enjoy this little video. I look forward to making more of them! P.S. July 1st, 2017 will mark the 100th anniversary of William Gillock’s birth. Even though 2016 is barely half over, I can say that it has been one of the crummiest years I have experienced. This isn’t because of life’s usual turmoil but because my Daddy died. I knew the day would eventually be here and I dreaded it. I probably dreaded it for more than 30 years. That’s a long time to dread something. Gino R. Narboni was born on November 18th, 1923 and died on July 16th, 2016. My father was a unique individual who was kind to everyone. He touched many lives–as a medical oncologist and as a father, husband, friend and hero. I miss his intelligence, his wit, his insight and his gentle nature. I have a picture of him on my desk that became the front page of his funeral program. I love this picture. He is looking directly at the camera and has a smile on his face. He is wearing his special “birthday suit” that my parents bought many years ago. My mother thinks they bought it at a PX in Germany. It was on the reduced rack for $15.00. Apparently, jewel-toned velvet suits were all the rage that year. To think that it still fit him when he was 90 years old is amazing. When Heath and I bought this house in Bulverde last year, we were delighted to find an area that had obviously been a vegetable garden a long time ago. It was overgrown with weeds and volunteer trees but it had a fence around it and was perfectly situated on our property. 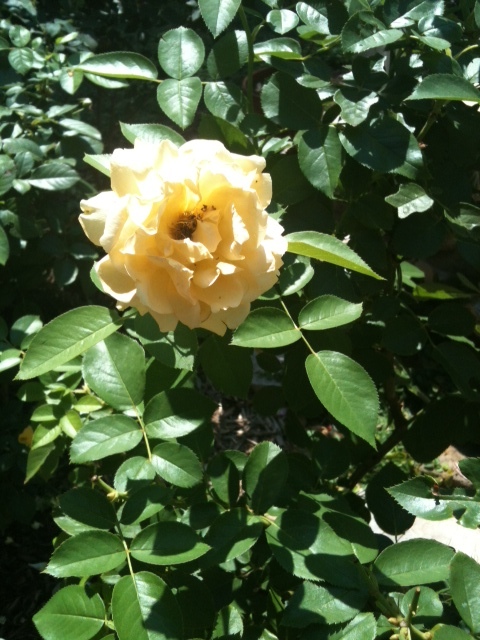 (It is close to the house and there is a beautiful live oak that provides shade around the garden but not over it.) Heath and I cleaned it out and I planted tomatoes and herbs this past spring. Since the fence around it was only about 4 feet tall, the deer considered our tomato plants (and shallots and red onions) to have been planted expressly for their eating pleasure. I think we probably harvested 3 tomatoes all season. So back to how this became “Daddy’s Garden”…Heath spent a long time thinking about how to build a fence around the garden that would be both functional and beautiful. His solution became what we call the non-pergola. The walls of this non-pergola are made of wood frames with hog fencing spanning each frame. It is VERY hard to describe but see the pictures below. Once it is finished, Heath he is going to build ‘troughs’ and hang the troughs on top of the fence. He really wants to grow strawberries so we will plant them in the troughs and hopefully, the plants will cascade down and make a beautiful border around the top of the fence. I don’t think he has figured out how to water the plants, yet. Keep in mind that the fence is probably 10 feet tall! I decided to dedicate this garden to my Daddy about halfway through its construction. I realized I was going to fill it with so many of the fruits and vegetables that he loved it was natural that it be created and maintained in his honor. Eventually I am going to hang a large gong-like wind chime because I know that my father would have enjoyed the sound of it. I hope that his spirit will fill the garden so that I know he is always close by. Last Friday, I was walking Carl Spencer around the neighborhood like I always do and we came across a garage sale. I immediately stopped and started poking through the clutter. I didn’t see anything interesting so I decided to continue walking. But then, something caught my eye. 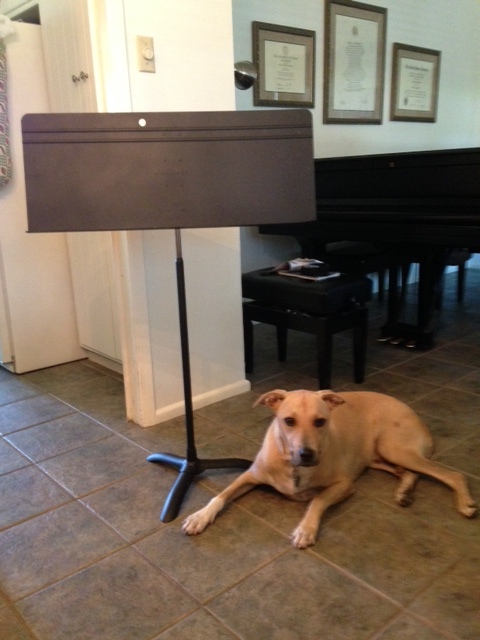 Leaning against the garage was a double-length Manhasset Music Stand for $3.00! To think I was the first person to recognize this amazing ganz medsea — WOW! I quickly handed over the $3 and whisked away my purchase. Now when friends come over to rehearse and make music, the floor doesn’t have to be littered with music! In musical vocabulary, words such as forte, piano, subito, diminuendo, ritardando, etc. are common, everyday words. To me, those words are important because they describe in simple terms, how to play a passage. But do they actually describe the character of the music? Words like coquettish, menacing and joyful are much more effective at sparking students’ inspiration. How about fragile? Or despondent? Another favorite of mine is ominous. Hmmm, I also really like fierce. And caress. Now, how do you define the word caress to a 10-year old? Thank you for giving me the opportunity to talk with you today. As an introduction, I would like to share a little of my background and how I came to San Antonio. 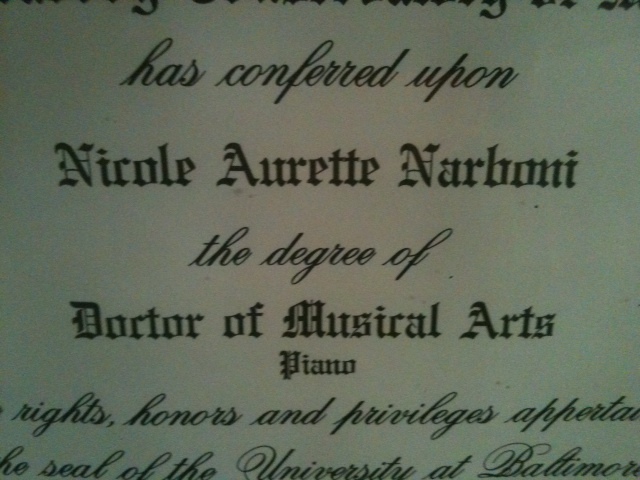 For 16 years, I served on the piano faculty at the University of Nebraska-Lincoln. While there, I taught pianists at both the undergraduate and graduate levels, coached countless musical ensembles and advised hundreds of students in my role as academic advisor. I was also actively performing as a member of the Clinton-Narboni Piano Duo. Our Duo enjoyed a great deal of success–we played concerts here in America as well as Europe and recorded four cds over the course of 5 years. As a solo artist, I have also played concerts around the country and abroad, recorded a cd featuring the solo piano works of Jean Françaix and recently participated in a teleconference with young students from the Coupland, Texas Independent School District. On that occasion, I talked about and played a set of variations by Beethoven. By far, that was the most unusual performance I have given because the entire event was centered around a laptop! I always knew that Nebraska was my temporary home. I had enjoyed many successes at UNL and in the Midwest but my heart belonged to Texas. In 2011, I decided it was time to move back to San Antonio. So, I put my LIncoln house on the market and started looking for employment down here. My official moving day was September 22nd, 2012, when my partner and I drove a large rental truck with all of my worldly possessions (including 2 grand pianos) 875 miles south. The idea for this lecture came to me long before I was asked to speak for San Antonio Music Teachers’ Association. I have been thinking about my musical legacy ever since I turned 40 when I began taking stock in my accomplishments and my long list of goals yet to be fulfilled. As I mentioned, for many years, I enjoyed a very successful career with my former duo-piano partner but we eventually dissolved the partnership and I found myself struggling to find gigs. It was at that time that a friend of mine suggested I create my own performance opportunities by taking my piano out on the road. Sort of, “If the people can’t come to you, you come to the people.” And thus, “Piano-in-Tow” was born. The mission of “Piano-in-Tow” was to bring live, classical music to rural areas in Nebraska and surrounding states where access to live music was very limited. A major draw for audiences of “PiT” was the fact that I brought my own piano to concerts. Most towns and villages that I visited did not have a grand piano. They were lucky just to have an old, out-of-tune upright housed in the church basement! Not only did “Piano-in-Tow” give me many opportunities to perform, it also helped me to reach and develop new audiences. As I’m sure you all know, classical music audiences have been dying for over the past several generations. As our world has become more technologically advanced, sitting and listening to unplugged music can’t compete with the allure of video games, twitter, Facebook, YouTube, etc. I would like to paint a picture for you of what “Piano-in-Tow looked like: During four week-long trips between 2008-2010, I rented an 18-passenger van that I used to haul a friend’s homemade trailer housing my piano. This trailer was unique–it was very large and since it was meant to be a hunting trailer, my friend had painted the exterior in a camo-motif and named her “Just Lovely”! With the help of my trusty piano mover and driver, I toured the Midwest playing and teaching in school gymnasiums, fellowship halls, libraries, even a barn turned museum! My audience members ranged from 5 to 90 years old. Now you may be asking yourself what does “Piano-in-Tow” have to do with creating a musical legacy? The answer is simple–I figured if I was able to reach even just one person and ignite their interest in classical music, than I had achieved my goal. Although I have never thought of myself as a defender of musical culture, I have spent most of my life trying to create and sustain a reluctant public’s interest in classical music. Even with the success of “Piano-in-Tow”, I knew if I were to die tomorrow, my musical footprint would be small. What else could I do to positively impact the world? The ironic thing is that when I was younger, I didn’t view teaching and mentoring as part of my musical legacy. I guess I considered interactions with students just part of the job. But, as I was making plans to move to Texas, I realized I would be leaving behind a very important part of me. Although I had given a lot of myself to these students in Nebraska, I too, had benefited. These relationships had been mutually enriching. They allowed me to gain a better perspective on who I was and who I wanted to be as a musician and a teacher. I also came to recognize that teaching wasn’t just about sharing musical ideas or solving technical problems. A good teacher must also be a part-time psychiatrist! For most of the 16 years that I taught at UNL, my office was on the third floor of the music building. (I had been banished to the practice room floor the second year I was there.) The other piano faculty offices were all on the second floor. Of course, the second floor was much quieter than the third floor where all of the students spent most of their time. I discovered that in spite of all the noise and chaos on that top floor, there was an advantage to being housed up there–my studio was much more accessible to the students. If my door was open, I was almost never alone! Students would just saunter in, looking for conversation or chocolate or advice. These informal gatherings allowed me to develop nurturing relationships with students, both pianists and others. I still cherish many of the relationships that I forged while my door was open. Did you think when you started teaching music that your job description might include teacher, mentor and therapist? Successful teachers must first gain a student’s trust. We must be sensitive to body language and other subtle cues from our students. How else do you tailor your teaching style to your students’ individual learning styles? How else do you coax a student to express his or her innermost feelings to an audience of strangers? The privilege of teaching carries with it an enormous responsibility. As teachers, we have the opportunity to be a tremendous positive or negative influence on our students. As an example, my first “serious” teacher was very influential on my musical development. At the time, I didn’t recognize this because she was a task-master and could be downright mean. There were times that I dreaded my piano lessons. For an 11-year old struggling with her own identity, learning how to play the piano could be very painful. Some of my other teachers were even more unkind, sometimes bordering on cruel. These interactions I experienced shaped my resolution as a teacher to always be kind, to never lose my patience and give encouragement even for the smallest accomplishments. We as teachers have the unique opportunity to ignite and hopefully sustain our students’ interest in the arts. We must take this responsibility seriously because how else will we save classical music from becoming a dinosaur? I challenge all of you to examine what is important to you about teaching music. I realize that not every student comes to his or her lesson willingly! But even those students can learn something because studying music has many side benefits. It is so easy to focus on the problems we encounter during lessons but what we need to keep in mind are the benefits that our students gain beyond the musical proficiency itself. Students learn discipline and patience. They learn to accept criticism. They learn the importance of setting goals. And, as many studies have shown, playing music opens the mind to all kinds of learning. As music teachers, we are the mentors and cultural ambassadors for our art. I believe that that is the legacy we must all share in creating. I would like to leave you with a quote from a parable by La Fontaine called “La Laboreur et ses Enfants“. My father used to recite this to me at the end of every one of our phone conversations while I was a doctoral student at Peabody. Your foundation is just the beginning. This is a very short article I wrote for the Armstrong Community Music School website. Parents of music students can look at my suggestions from several different angles. Many of my friends know what angle I would be interested in!!! How can I help my child to maximize the benefits of music lessons? In my many years of teaching, I have come to recognize several important facts. Probably the most significant one is that children whose parents take an active role in their practice sessions at home come to their lessons better prepared and more eager to learn than those children whose parents don’t offer some at-home supervision. Typically, when a student is well-prepared for his/her lesson, they are excited about coming to their piano lesson and eager to share with me what musical accomplishment they have made in the past week. (Some even work ahead of the material I have assigned.) These students have parents who sit with them regularly to review lesson materials, ask and answer questions, and make sure that written assignments are completed. I think this kind of gentle assistance develops confidence and a feeling of well-being in a young child. Music lessons should be viewed as fun, not as a chore. Even when a parent doesn’t have any formal musical training, they can inquire about their child’s lesson, review the given assignments and encourage their child to practice every day. For me, parent participation in daily practicing is a win-win. The child will certainly notice improvement, I can spend lesson time on new material instead of reviewing old information and as a bonus, the parent can know that he or she is getting his or her money’s worth! As many of you probably know, I am an animal lover, particularly cats. I have been involved in some form of cat rescue for many years. When I moved to San Antonio, I was dismayed to find an overwhelming population of stray and feral cats in my neighborhood. So, I decided (along with my S.O. Heath Cole) to start our own TNR or Trap-Neuter-Release program. San Antonio is very fortunate to have many low-cost options for spaying and neutering including the San Antonio Humane Society. Their services are VERY reasonable and the process is uncomplicated. 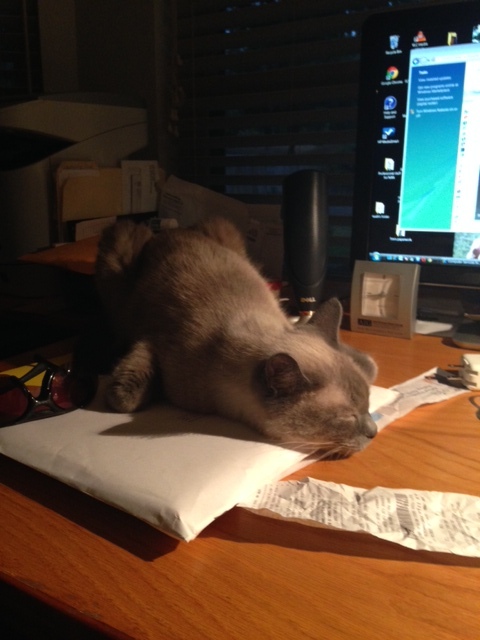 Drop-off kitty in trap in the early morning, pick-up after 4:30pm the same day. So far we have trapped 3 cats–one male and two females. We decided to name the male Snoopy because it was his snoopiness that got him into trouble (aka the trap). After he was neutered and ear-tipped (international symbol of altered feral cat) , we re-released him into the neighborhood. Then we trapped Little Miss Muffett who had been hanging around the house every evening, asking for food. It took us weeks to trap her because she was very trap-savvy. We would set the trap and she would carefully stick her long neck into the chute, grab food and step back out, all the while avoiding the trigger. One night, she got a little cavalier and caught herself in the trap. 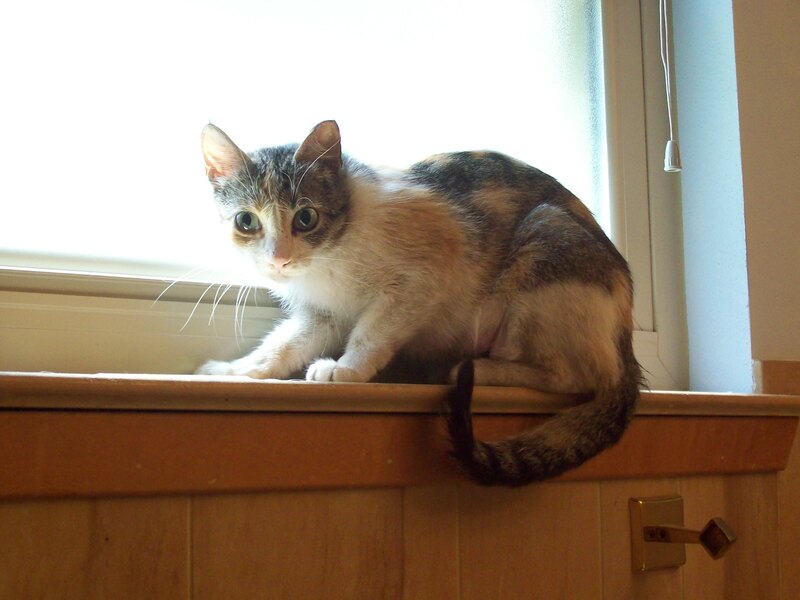 Turns out when the veterinarian shaved her belly in preparation for the spay, she discovered a spay scar! Thus, we re-released Little Miss Muffett to the backyard, knowing that she could live a relatively safe and kitten-free life in our neighborhood. She continues to come to the back door every night in anticipation of dinner. Our most recent score is a female named Little Miss Penny P. She had been living underneath the building of the Crossroads BBQ restaurant and I had spotted her several times while Heath and his band (The Coup Deville’s) gigged there on Wednesdays and Saturdays. We set a trap on a Sunday night while the restaurant was closed in hopes that she would be willing to come out while it was quiet. While we sat in the car about 100 feet away (Heath played Angry Birds and I read a book), she eventually crawled out from underneath the restaurant and immediately discovered the food. Eventually, she got into the trap and the rest is history. We will re-release her into our neighborhood once she has acclimated to our area.